The African Regional Intellectual Property Organization (ARIPO) was established in 1973, upon the request of English-speaking African countries for assistance in pooling their resources together in industrial property. The ARIPO's main objective is "the study and promotion of and co-operation in industrial property matters". 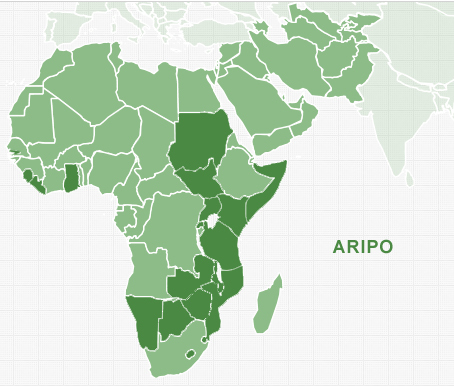 ARIPO applications require the applicant to designate the countries of interest in the application. A single application does not automatically include all member states. The history of ARIPO goes back to the early seventies when a Regional Seminar on patents and copyright for English - speaking African countries was held in Nairobi. That seminar recommended that a regional industrial property organization be set up. In 1973 the United Nations Economic Commission for Africa (UNECA) and the World Intellectual Property Organization (WIPO) responded to a request by these English-speaking countries for assistance in pooling their resources together in industrial property matters by establishing a regional organization. Following a number of meetings at ECA headquarters in Addis Ababa and WIPO in Geneva, a draft Agreement on the Creation of the Industrial Property Organization for English-speaking Africa (ESARIPO) was prepared. This agreement, now known as the Lusaka Agreement, was adopted by a Diplomatic Conference held in Lusaka, Zambia on December 9, 1976. ARIPO was mainly established to pool the resources of its member countries in industrial property matters together in order to avoid duplication of financial and human resources. Thus the preamble to the Lusaka Agreement clearly states that member states are "aware of the advantage to be derived by them from the effective and continuous exchange of information and harmonization and co-ordination of their laws and activities in industrial property matters". Member states also recognized that the "creation of an African regional industrial property organizationfor the study and promotion of and co-operation in industrial property matters would best serve" that purpose. In determining its objectives, the founding fathers of the organization took into account the fact that, at that time, the majority of the countries concerned had "dependent industrial property legislations" which did not provide for original grant or registration in the countries concerned but could only extend to their territories the effects of industrial property rights obtained in a foreign country (in most cases the United Kingdom). Such effects were normally governed by law of the foreign country. 9. to do all such other things as may be desirable for the achievement of these objectives. It is clear from the above objectives that the common thread running through them is the idea of cooperation. The concept of cooperation plays an important role in the functions of the Organization.